I was down at my favorite location in Dublin docklands, the Great South Wall, walking my friends Oran and Sarah and their three dogs on Friday evening. 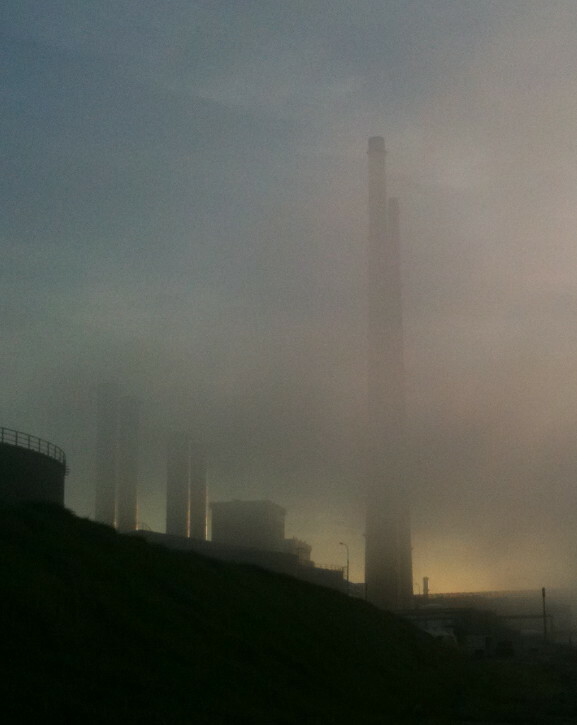 It had been an exceptionally sunny day, and within seconds of our arrival a wall of sea mist came rolling in towards us, blanketing the bottom of the Pigeon House towers, blotting our view of the bay, and muffling and distorting the sounds of nearby shipping. 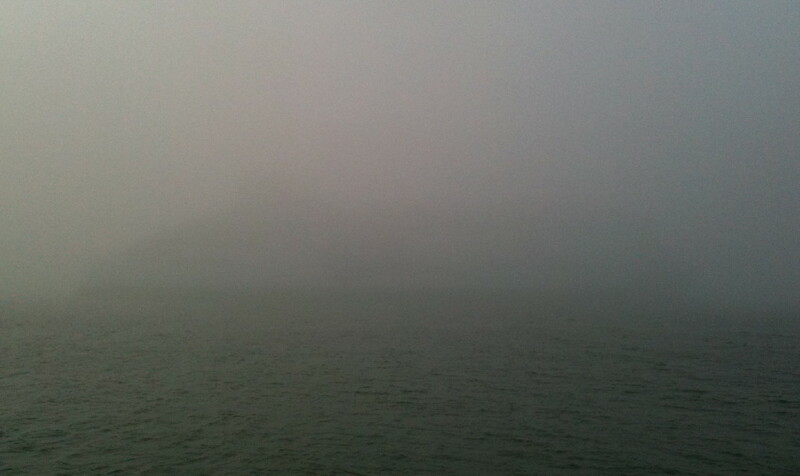 The almost invisible Ulysses creeps through the fog, outbound from Dublin Port. We watched the Irish Ferries Ulysses creep out of the port at quarter speed, a grey mass almost impossible to perceive against a swirling grey background, sounding its foghorn every minute as it shared the narrow channel with a cargo ferry creeping in the other direction. A new twist on one of my most loved places. Great to see Phantom 105.2 doing well in the latest JNLR Listening figures for Irish Radio, managing to increase market share in a very crowded market. Results from the JNLR/Ipsos MRBI survey for the period April 2009 – March 2010 were released today (Thursday 13th May). The survey results indicate that 86% (-1) of the adult population was listening daily to a mix of national, regional multi-city and local radio throughout the country. Listenership to any multi-city/regional/local radio service remained the same at 58%. Weekday reach figures for RTÉ 2FM and RTÉ Lyric FM are unchanged at 15% and 3% respectively. Slight reductions were recorded for RTÉ Radio 1 at 25% (-1), Today FM at 14% (-1) and Newstalk at 7% (-1). With regard to market share, an increased figure of 51.9% (+1.3) was recorded for any multi-city/regional/local station in the 7a.m.-7p.m. period. RTÉ Lyric FM retained its market share of 1.6%. Small decreases in market share were recorded for the remaining national stations: RTÉ Radio 1 at 22.9% (-0.5), RTÉ 2FM at 9.7% (-0.4), Today FM at 9.6% (-0.3) and Newstalk at 3.9% (-0.1). Changes in both reach and market share were recorded for almost all local stations in the current survey period. Beat 102-103FM, serving the south-east, achieved a weekday reach figure of 19% (-1.0) and recorded a market share figure of 12.1% (-0.1). In the north-west region, i102-104 increased both reach and share figures to 19% (+2.0) and 11.9% (+0.9) respectively. Spin South West maintained its 18% reach figure, and obtained a market share figure of 9.8% (same). Figures for the north-east/midlands regional service i105-107FM demonstrated an increase in daily listenership to 6% (+3) and market share of 3.6% (+1.6). 4FM, the multi-city service, achieved a weekday reach of 2% (same) and achieved a market share of 1.5% (+0.1). FM104 continues to have the highest weekday reach of local Dublin stations at 19% (-1) Weekday reach figures for the majority of remaining local Dublin stations remained the same when compared to the previous survey period: Dublin’s 98FM at 15%; Spin 1038FM at 13%; Country Mix 106.8 at 4%; and Phantom 105.2 at 3%. Q102 recorded a reach figure of 12% (-1.0) for the current survey period. 98FM recorded the highest market share figure of the local Dublin stations in the April 09-March 10 survey period at 11.6%(+1.2). Other increases in market share were recorded for Dublin’s Q102 at 9.4% (+0.8); Spin 1038 at 6% (+0.2) and Phantom 105.2 at 1.5% (+0.1). County Mix 106.8 retained its market share of 3% while FM104 achieved a market share of 10.5% (-0.2). The combined figures for Cork’s 96FM/C103 showed reductions in both reach and share, at 48% (-2.0) and 43.6% (-1.4) respectively. Separate figures for both services are detailed in the tables provided. Cork’s Red FM recorded increases in their reach and market share, achieving figures of 21% (+1.0) and 10.3% (+0.5) respectively. Full details of the reach and market share figures together with the weekly reach figures for all stations are available at the BAI website. Now I’m back in Ireland I have, as promised, put together a good selection of photos from my week aboard the floating rock station off the Dutch coast, Radio Seagull, and its ship, the Jenni Baynton. The tender that took me back to land at the end of my stint aboard the radioship Jenni Baynton was somewhat larger than the run of the mill supply vessel. 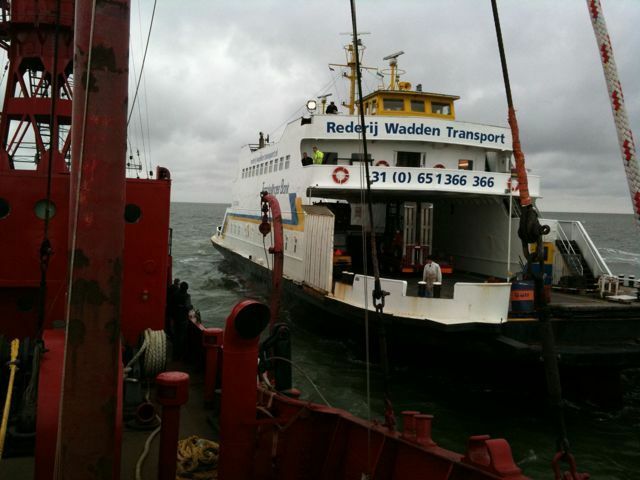 Thanks to the enthusiasm and helpfull stance of a local ferry captain, Radio Seagull / Waddenzee is able to make use of regular ferry runs when no dedicated suply boat is scheduled. 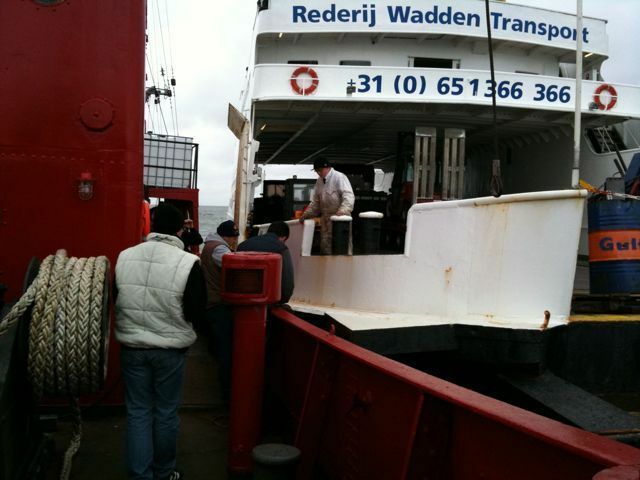 The skill with which Captain Freddie brings his car ferry alongside the radioship is matched by his warm welcome for members of the radioship’s crew using his service. Below are some shots taken as I was leaving the Jenni Baynton on Friday afternoon. Don’t forget I will have a full photo update on Sunday night. The week has flown past. 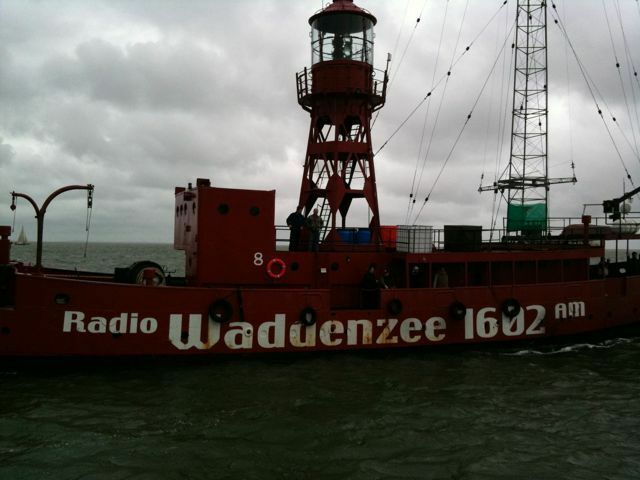 One last show on Radio Waddenzee (the Dutch daytime service) and I’m off to land on the tender shortly afterwards. Has been an amazing week. Will do a big picture update when I’m back in Ireland on Sunday (volcanic ash permitting). 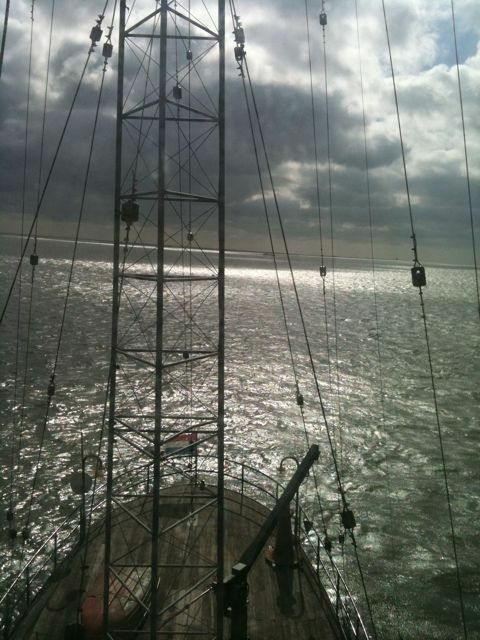 My fourth night on board the Jenni Baynton and I am standing anchor watch for the first time. 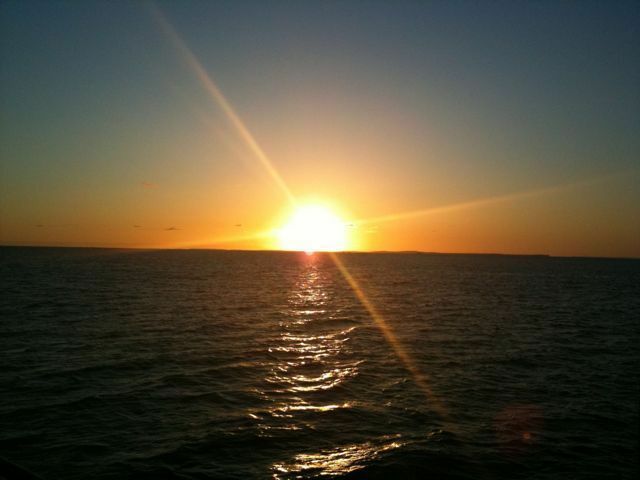 Basically this involves being awake and alert through the night, being aware of the ship’s position and anything going on in the vacinity, as well as doing a walk around each hour to check all is well, paying particular attention to the anchor cable. It’s my first time having any kind of marine responsibility since the last days of Caroline at sea, and I take it seriously. 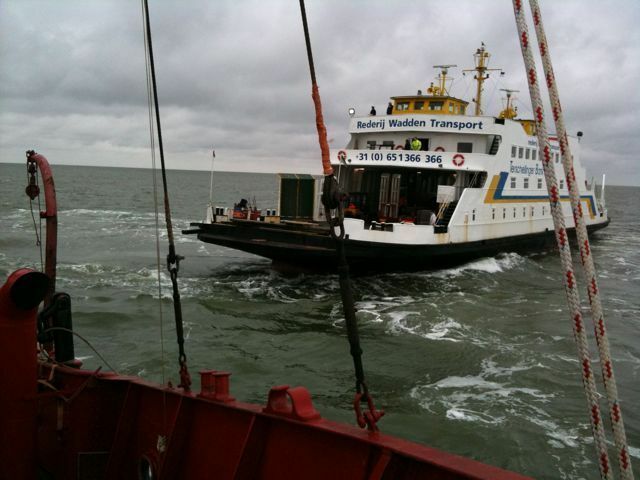 Sure, I’ll joke that I crashed the last ship I looked after into a sandbank, but in truth I can’t forget how our arrival on the Goodwin Sands in the early hours of the morning came as a complete shock to us, when really we should have noticed earlier that we were out of position. After more than 1500 days anchored at the Falls Head, complacency had crept in, with me as guilty as anyone. Not that the outcome would have been changed in any way by our awareness, but in different circumstances the delay in gaining situational awareness could have been critical. So now I’m acutely aware of how easy it is for things to change on even the most innocent looking of nights, and I acting accordingly. 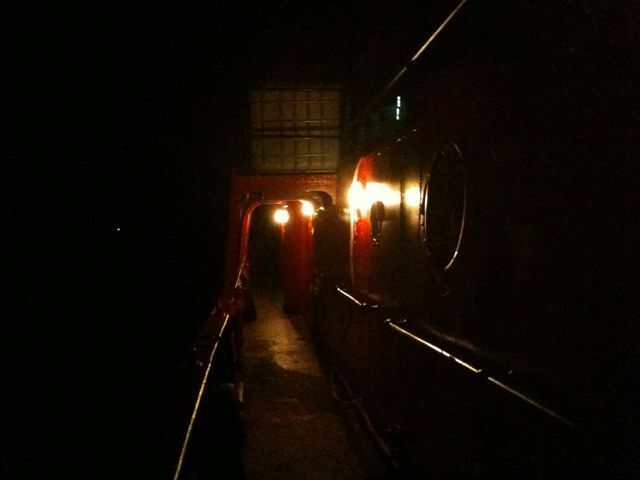 The studio is the highest and warmest room inside the ship and with the best view, but lots of distractions too. So my back is to the music, my gaze is outwards, and my walkabouts are regular and thorough. As I write this it is 0449 nearly time for my next round, and the horizon to the east is already glowing a predawn blue. Another couple of hours and it will be time for bed. 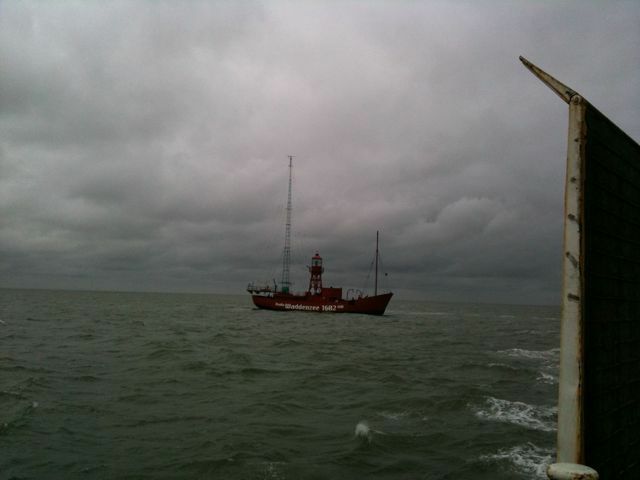 My 4th day on board the former lightship turned offshore radioship Jenni Baynton off the coast of Holland. 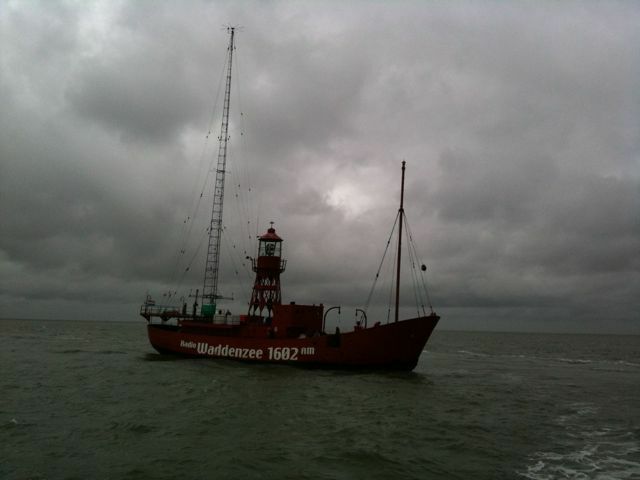 I’m having great fun presenting programmes on both Radios Waddenzee and Seagull, and will be on Seagull again tonight from 2100-000 UK time (2200-0100 en Nederlands). 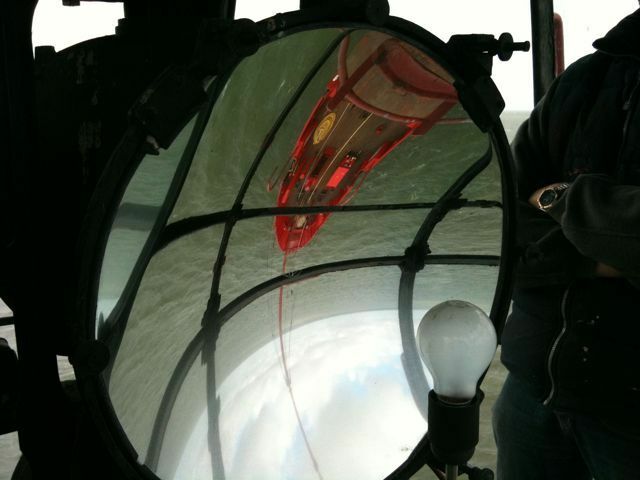 Today I got to do something really exciting – climb up the ladders to the top of the on board lighthouse tower, and stand in the glass room at the very top, with 360 degree view from a 50 foot elevation above deck. The light room has an amazing atmosphere and is full of strange distorted images in the giant mirrors. An interesting place to sit and think, and possibly a very inspiring writing place. I’ll write in more detail and share lots of views when I’m back on land and don’t have to do this through a mobile phone, which is a pain! But for now here are a couple of shots to be getting on with, of the view out high over the back deck, and the front of the ship, curved and upside down in the lightmirror.